A pharmacist prepares medicines to treat a patient suffering from smallpox in this illustration from a 17th-century Ottoman manuscript of Ibn Sina’s Canon of Medicine. Al-Biruni’s definition of the pharmacist could have been written today. Along the road from sympathetic magic and shamanism to scientific method, much trailblazing was carried out over a few centuries by scholars, alchemists, physicians and polymaths of the Muslim Middle East, and their rules, procedures and expectations are, to a great extent, practiced almost universally today. “In the West and the Middle East, early medicine as a whole was primarily a fusion of Greek, Indian, Persian and later Roman practices that had progressed over the better part of a millennium. Texts on medications were common, but most of thesemateria medica were simply lists of plants and minerals and their various effects. By the start of the seventh century ce Europe and much of the Near East had weakened culturally, and those achievements of Hellenistic arts, sciences and humanities that had not been erased were on an intellectual endangered-species list. “By mid-century, the rise of Islam brought with it a new thirst for knowledge. This openness to discovery began the saving and, eventually, the expansion of much of what the classical world had lost. Nowhere was this truer than in the ﬁeld of health, where medical practitioners took guidance from several hadiths (hah-DEETH), or sayings of the Prophet Muhammad, such as this related by Bukhari: “God never inﬂicts a disease unless He makes a cure for it.” Similarly, Abu Darda narrated that the Prophet said, “God has sent down the disease and the cure, and He has appointed a cure for every disease, so treat yourselves medically.” Such words placed the responsibility for discovering cures squarely on the medical practitioner. Within a century of the death of the Prophet in 632 ce, one of the earliest systematic approaches to drugs was under way in Damascus at the court of the ruling Umayyads. Snake and dog bites, as well as the ill effects of scorpions, spiders and other animals, were all causes of concern, and the poisonous properties of minerals and plants such as aconite, mandrake and black hellebore were exploited. As with most most areas of medicine at the time, Greek physicians Galen and Dioscorides were considered the ancient authorities, and building off their works, Muslim writers discussed with particular interest poisons and theriacs (antidotes). Sudden death was not uncommon in royal courts, and it was frequently attributed, often erroneously, to poison. Not surprisingly, fear of poison convinced Umayyad leaders of the need to study them, detect them and cure them. 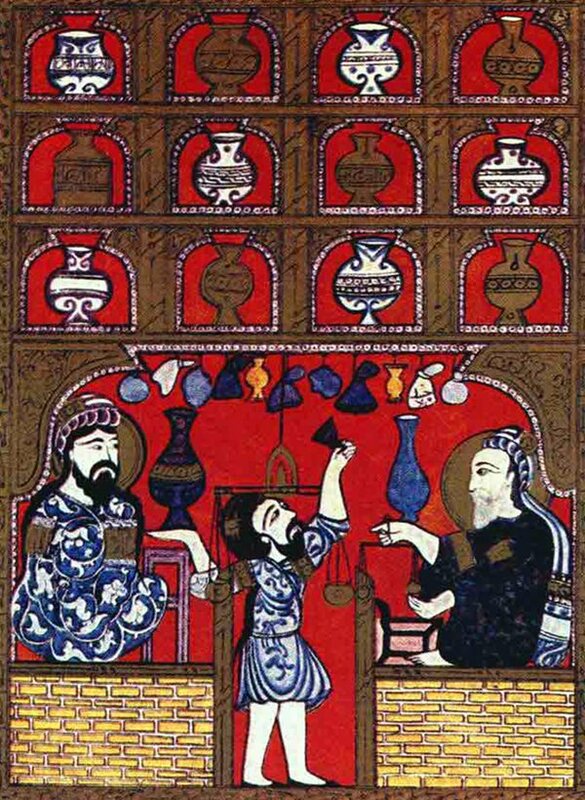 As a result, much of early Islamic pharmacy was done by alchemists working in toxicology. The ﬁrst of these was Ibn Uthal, a Christian who served as physician to the ﬁrst Umayyad caliph, Mu’awiyah. Ibn Uthal was a noted alchemist who had conducted a systematic study of poisons and antidotes. He was also reported to be Mu’awiyah’s silent executioner, and in 667 he was himself poisoned in an act of vengeance by the relatives of one of his alleged victims. Another Christian physician-pharmacist, Abu al-Hakam al-Dimashqi, served the second Umayyad caliph, Yazid. Yazid’s son, Khalid bin Yazid, took particular interest in alchemy, and he employed Greek philosophers who were living in Egypt. He rewarded them well, and they translated Greek and Egyptian books on chemistry, medicine and astronomy into Arabic. 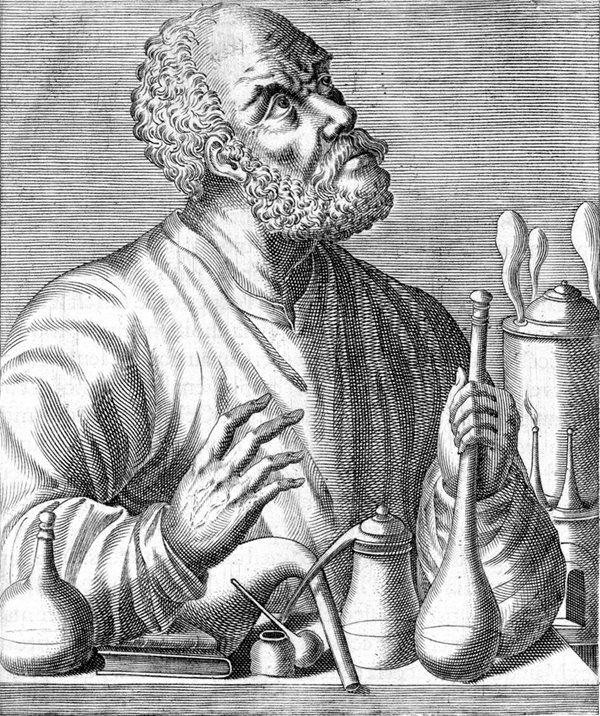 A contemporary of Khalid’s was Jabir ibn Hayyan, called Geber in the West, who promoted alchemy as a profession, laying early foundations for chemical and biochemical research. unproven belief (superstition) in favor of the compilation and application of procedures, measurements and demonstrated trials that could be tested and reproduced, their work represented the true advent of the scientiﬁc method. The role of scientiﬁc alchemy cannot be overemphasized. 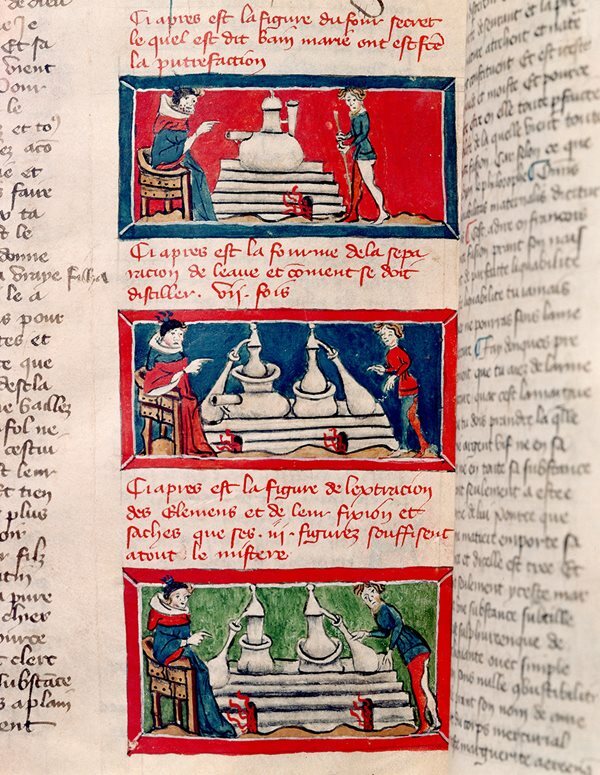 By the ninth century, the trend, approach and type of information that circulated in Arabic alchemical manuals represented some of the best work in this ﬁeld. 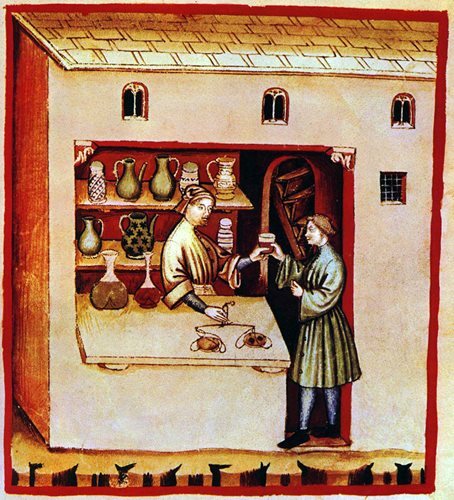 The careful methodology the alchemists developed served all ﬁelds, including pharmacy. In the process of experimenting in making amalgamations and elixirs, important mineral and chemical substances were used, such as sal ammoniac, vitriols, sulphur, arsenic, common salt, quicklime, malachite, manganese, marcasite, natron, impure sodium borate and vinegar. Among simples of botanical origin, they used fennel, saffron, pomegranate rinds, celery, leek, sesame, rocket, olives, mustard and lichen. Signiﬁcant gums such as frankincense and acacia were used, as well as animal products including hair, blood, egg white, milk (both fresh and sour), honey and dung. Laboratory equipment consisted of pots, pans, tubes, retorts, alembics, crucibles and various distilling apparatus; covering platters, ceramic jars, tumblers, mortars and pestles (often made of glass or metals); as well as tripods, scales and medicinal bottles. The range and scope of alchemical operations included processes often used today: distillation, sublimation, evaporation, pulverization, washing, straining, cooking, calcination and condensation (the thickening of liquid compounds). While translation of Greek, Persian and Indian scientiﬁc books into Arabic had begun under the Umayyad caliphate, it blossomed in the ninth century under the Baghdad-based Abbasids. Hunayn ibn Ishaq, with his superlative knowledge of Syriac, Greek and Arabic, was probably the greatest of the translators, and his works included most of the corpus of Hippocrates and Galen. Intellectual ferment, reinforced by support from the highest levels of government, paved the way for some 400 years of achievements. Methods of extracting and preparing medicines were brought to a high art, and these techniques became the essential processes of pharmacy and chemistry. A pharmacist was called saydalani, a name derived from the Sanskrit for a seller of sandalwood. The saydalanis introduced new drugs including—not unexpectedly— sandalwood, but also camphor, senna, rhubarb, musk, myrrh, cassia, tamarind, nutmeg, alum, aloes, cloves, coconut, nuxvomica, cubeb, aconite, ambergris, mercury and more. They further introduced hemp and henbane as anesthetics, and they dispensed these in the forms of ointments, pills, elixirs, confections, tinctures, suppositories and inhalants. As was the case in Europe and America up to modern times, many prominent physicians in Islamic lands prepared some medications for their patients themselves. While Al-Majusi, Al-Zahrawi and Ibn Sina are all good examples, they are actually exceptions, for the typical medical professional often welcomed the separate, specialized role of a saydalani, whose work proved as distinct from medicine as grammar is from composition. By the beginning of the ninth century, Baghdad saw a rapid expansion of private pharmacy shops, a trend that quickly spread to other Muslim cities. Initially these were unregulated and managed by personnel of inconsistent quality, but all that changed as pharmacy students were trained in a combination of classroom exercises coupled with day-to-day practical experiences with drugs, and decrees by the caliphs al-Mamun and al-Mutasim required pharmacists to pass examinations and become licensed professionals pledged to follow the physician’s prescriptions. To avoid conflicts of interest, doctors were barred from owning or sharing ownership in a pharmacy. Pharmacists and their shops were periodically inspected by amuhtasib, a government-appointed inspector of weights and measures who checked to see that the medicines were mixed properly, not diluted and kept in clean jars. Violators were fined or beaten. Hospitals developed their own dispensaries attached to manufacturing laboratories. The hospital was run by a three-man board comprising a non-medical administrator, a physician who served as mutwalli(dean) and the shaykh saydalani, the chief pharmacist, who oversaw the dispensary. Around this time pharmacy developed its own specialized literature. 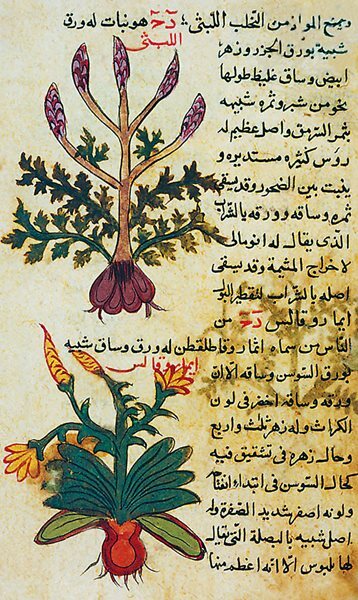 It built first on Dioscorides’ materia medica of some 500 substances, and then also on Nestorian physician Yuhanna bin Masawayh, a second-generation pharmacist, who penned an early treatise on therapeutic plants and aromatics. It was a younger colleague, Abu al-Hasan ‘Ali ibn Sahl Rabban al-Tabari, who said that the therapeutic value of each drug needed to be reconciled with the particular disease, and he urged physicians not to simply provide a routine remedy. He identiﬁed the best sources for components, stating, for example, that the ﬁnest black myrobalan comes from Kabul; aloes, from Socotra; and aromatic spices, from India. He recommended glass or ceramic storage vessels for liquid drugs, special small jars for eye liquid salves and lead containers for fatty substances. To treat ulcerated wounds, he prescribed an ointment made of juniper gum, fat, butter and pitch. In addition, he warned that one mithqal (about four grams) of opium or henbane causes sleep and also death. The ﬁrst known medical formulary was prepared in the mid-ninth century by Al-Aqrabadhin Sabur ibn Sahl for pharmacists in both private and hospital pharmacies. The book included medical recipes, techniques of compounding, pharmacological actions, dosages and the means of administration. The formulas were organized by tablets, powders, ointments, electuaries or syrups, and later, larger formularies followed his model. More generally, pharmacological drugs were classiﬁed into simples and compounds—mufraddat and murakkabat. The largest and most popular of themateria medica manuals, written by Ibn al-Baytar, born in Malaga in the kingdom of Granada toward the end of the 12th century, offered an alphabetical guide to more than 1,400 simples taken from Ibn al-Baytar’s own observations as well as 150 from named written sources. Today, every prescription ﬁlled, every pharmacy license granted, every elixir, syrup and medicament created, used or tested reﬂects this Islamic legacy. If what the alchemists and early medical practitioners did then seems all too obvious to us now, it is only because today’s obvious is yesterday’s discovery.